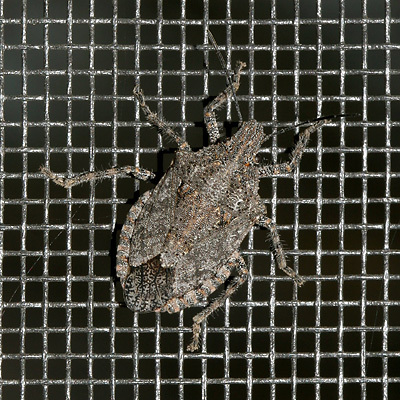 I recently observed this brown Stink Bug (Family Pentatomidae) on the inside of my screen door. Its dark, mottled brown coloration would help camouflage it on rocks or tree bark, but its coloration doesn't help the stink bug at all on a screen, and I quite easily spotted it. Knowing that stink bugs will release an odorous liquid from glands on the thorax if disturbed, I decided not to remove the trespassing stink bug myself, and instead I left the screen door open and the door closed so it could leave on its own. I don't know what species this one is, but it looks quite different than the green stink bug I previously found in my house. I don't know how they are getting in, but stink bugs are good fliers, so it may have flown in when the door was opened.